While I alternate sitting and standing at my really neat adjustable desk, impatiently waiting for Xenoblade Chronicles 2 to arrive while Googling the typical jail sentences for hijacking delivery vans, I wanted to start a write-up about Animal Crossing: Pocket Camp. Animal Crossing: Pocket Camp is Nintendo’s most recent foray into the mobile game racquet, or as I like to call it, “going to the bathroom at work is fun now” gaming. While it managed to capture the charm that Animal Crossing is known for, I feel it fell victim to the typical formulaic structure of free-to-play mobile games, taking that classic Nintendo charm and smothering it with the typical drudgery of mobile gaming. Thanks for reading my review about Animal Crossing: Pocket Camp! The rest of this post will be about porpoises. Look at this guy! Proud and majestic, like a big, wet teddy bear. Talk about a sly lookin’ fella! I bet this dude kills it with the lady porps! I’ve never seen a porpoise with such purpose! Alright, just kidding. 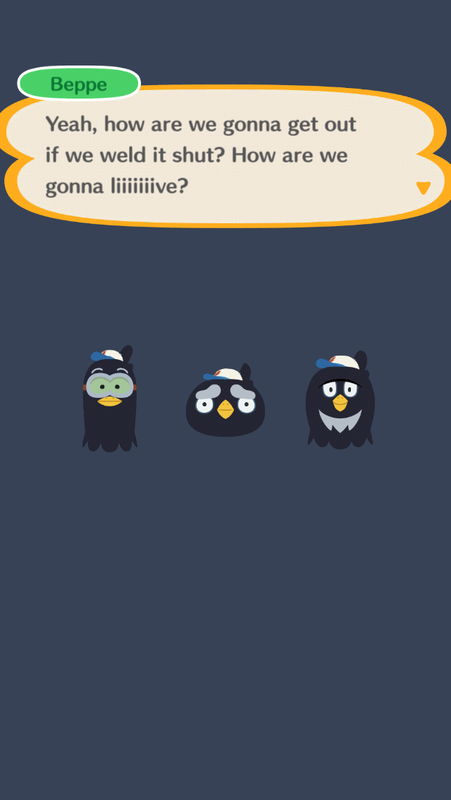 Let’s get back to Animal Crossing: Pocket Camp! Now I’m no stranger to simulation games and I understand that some people find these types of errand-running simulators relaxing. Fun, even. 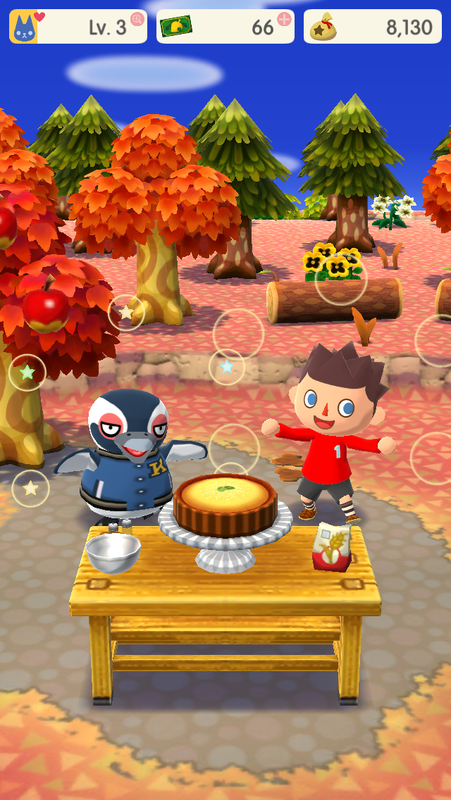 When unwinding after a long day of the typical drudgery and recovering between the normal existential crises, hunting for bugs and catching fish for talking animals seems to have captured a large subset of the gaming community for years now that Animal Crossing has been a franchise. It might seem surprising at all that I downloaded the game now that you know my opinion on the franchise, but as I was seeking something fun on my phone while standing still waiting for a bus, I realized that the App Store is still a total cesspool when it comes to games, yet I still wanted a nice little time waster. When I saw that Nintendo had finally released this mobile Animal Crossing game I’d heard about for the past several weeks, I had to bite. It was free, after all. Now if you’ve never played an Animal Crossing game, the central goal from what I understand is that you need to run errands around the little town and beyond, helping out the inhabitants, earning Bells (the in-game currency) and paying off a debt to a raccoon dog named Tom Nook. Those errands I mentioned are simple tasks that can best be described as relatively mindless, relaxing everyday tasks. You’ll go fishing, pick things up off the ground, drop off deliveries – those sorts of things. In Animal Crossing: Pocket Camp, this formula is slightly altered to fit the mobile gaming formula, but it isn’t much different overall. You take over as manager of a campsite, and are left in charge of getting your animal companions to come and visit, as well as sprucing the place up. You will find animal companions in the different areas of the map, and they will all greet you with small talk, and ask you nicely for items. These things, like fruit, fish, and bugs, can be picked and caught at various locations all over the map. 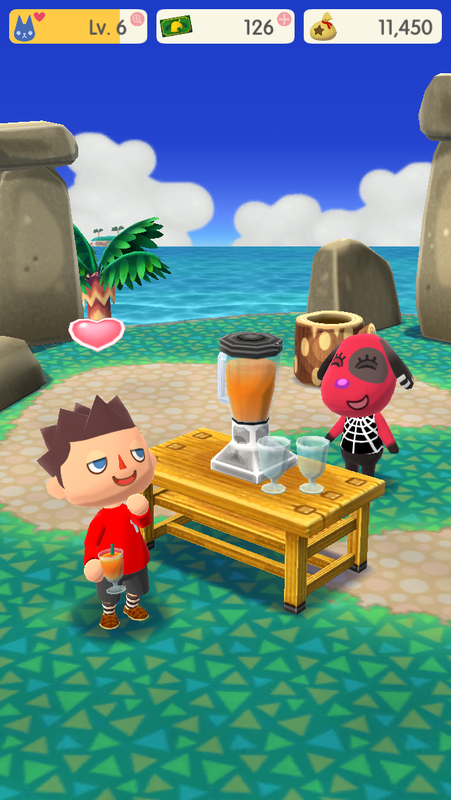 Once you complete a request, you will receive a modest reward of items and Bells, and you’ll get a little bump towards your own characters personal level. Speaking of personal level, there is a small amount of player customization at the beginning of the game. You can choose your gender, as well as a few style customizations such as hairstyle and eye color. You can also, say, put a dress on a guy, if that’s your cup of tea. Personally, I stuck to a plaid shirt and am eagerly awaiting the update to make your own clothes. Customizing your camping trailer is one of the core aspects of the game, and it reaches back to the earlier installments of the franchise in the sense that you take out a loan for modifications. You visit the OK Motors location from your map, at which point you can select new designs for your trailer, as well as extend the size of the interior. 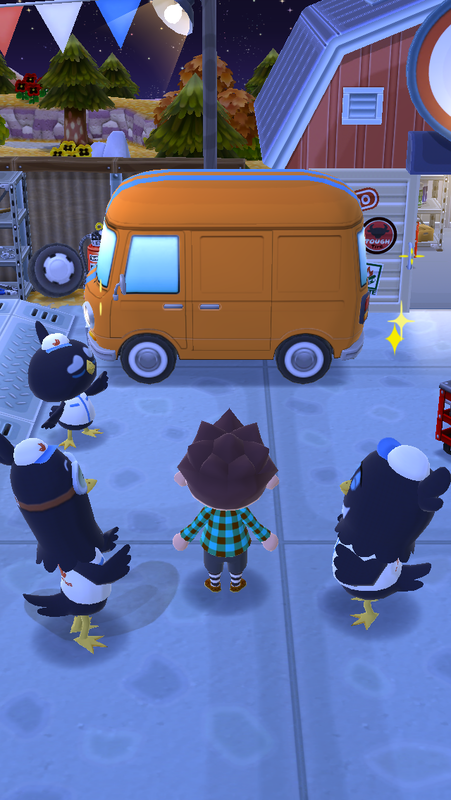 Whichever modifications you select will be installed by a crew of questionably capable owl mechanics (that is, owls who are mechanics, and not humans who work on mechanical owls), with the total amount of Bells being added to your loan amount. You can pay back this loan at your own pace, which brings up the question – at what point should we teach our children about interest rates? I’d love if my mortgage lender let me pay back whatever amount I wanted, whenever I felt like it! The United States has a bit of a credit problem and I think it’d be good to teach kids how to be responsible while pimpin’ their ride with 16.99% APR. Of course, earning Bells is relatively simple – as long as you wander about the map and collect whatever resources you can find, occasionally handing them over to your critter friends, you’ll make a good amount of money as you gradually level up. And boy, these animals sure do want a lot of stuff. 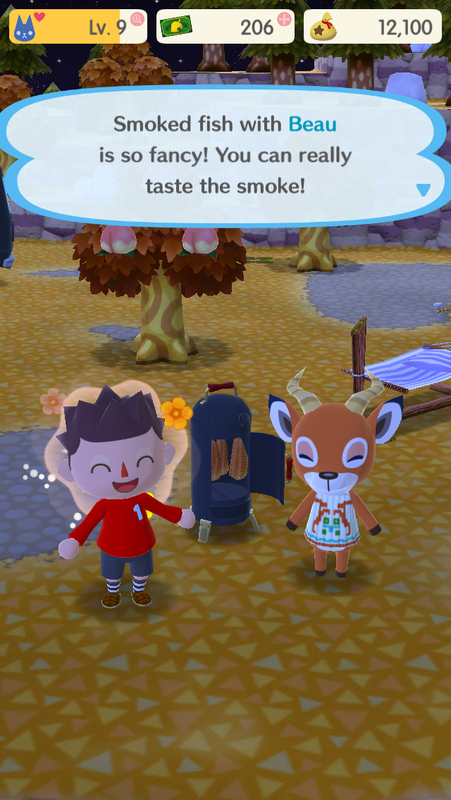 Is the underlying theme of Animal Crossing a subtle nod to the dangers of overconsumption? Seriously – the sheer volume of apples and squids I’ve handed out is mind-boggling, and I’m only level 14 as of this writing. What adds a layer of meaning to this otherwise bottomless pit of mundane requests is that some of the animals will take what you give them and make something for you in return. Don’t misunderstand, you don’t actually get anything, but for example, you can hand over several fish, and there’s some random chance that your animal friend will invite you to enjoy fish soup in a short little cutscene. Or hand over a pile of fruit and you’ll be treated to some smoothies. It’s cute, charming, and it makes you feel like less of an errand-runner and more of a buddy to anthropomorphic creatures. And we can all use more of those! Of course, the purpose of performing all of these tasks is to obtain materials, which can then be used to participate in the other 50% of the game: crafting items so that animals will visit your campsite. As you level up, more animals will become available to run errands for, which means more animals that require things to come visit. And let me tell you, there’s no shortage to what these critters want to see at your campsite. For instance, there’s a frog creature who demands an entire set of furniture in green. This cost a small fortune to produce, as steel is a required component in practically all of those things. In fact, steel turns out to be a precious a commodity in Animal Crossing: Pocket Camp as oil is to the entire world. You need it to craft practically everything – even when it doesn’t make sense at all. And not only do you need it, you constantly need huge amounts. And spending it on anything seems like you’re wasting it, so you end up hoarding it and never crafting anything. Oh right, I totally forgot about all the steel that goes into making crayons every year! Where I saw a lack of proper UI is when attempting to view the items that my animal friends required before coming to my camp site. The menu system sits on the southern edge of the screen and allows you to view all of your contacts, your map, items, and crafting table. However, after selecting a contact to view their requests, and then selecting an item to craft, there’s no easy way to go back to that requests screen. You need to tap Contacts again, scroll back to the character, and then scroll back through the requests screen again. It’s actually pretty annoying, as you often forget which character you were just crafting for. There’s simply no easy way to see all the requested items that you can craft, leaving you to screw around in the menu for too long. Now, I’ve spent a good hour or so throughout each day since launch trying to figure this game out, and it very quickly shows that it’s a freemium title. Of course, I expected that, but it becomes very quickly evident as the game persuades you to use Leaf Tickets, the in-game currency, to craft items for which you don’t quite have enough materials. This will happen very often, so you can easily drain your Leaf Tickets down to nothing if you’re even the slightest bit impatient. Around level 8 or 9, just about every single item I needed to craft to get animals to move in required at least 20 steel or more. As the rewards for completing tasks would maybe yield you 2x steel if you were lucky, it became blatantly obvious that I would be grinding for a while to be able to get any more animals to come to my campsite. In fact, out of the all the animals available, I’ve still only managed to get 7 to come stay at the site, due to my stinginess with the Leaf Tickets. All of them require at least 100 steel worth of furniture before they’ll even come by, and judging by how long it took me to get 30 steel (about 5 levels worth of completing requests), it’s just not balanced correctly. Nintendo could definitely fix this, although I don’t quite know if fixing this steel issue would work to their advantage at all for the obvious reason that you can already use Leaf Tickets, and Leaf Tickets are practically cash. One solution would be to allow the use of Bells to bridge the gap in lacking materials. Another would be to open another shop on the Map that lets you trade goods. Again – letting you use virtual items means that you won’t use actual money, so the incentive to do this is questionable. There are some other cool components to Animal Crossing: Pocket Camp, such as the online component. When you visit different areas of the map, you’ll see other players standing around. You can visit their campsite, check out what they’ve done with their trailer, befriend them, even send them “kudos”. Although the purpose is to add a social element to the game, it doesn’t feel much like a personal connection when you interact with another player. In fact, the only real purpose to give kudos at all is to complete short and long-term goals to get awards, like Bells and Leaf Tickets, and, yes, freaken Steel. The awards are fun to chase in all fairness, and pretty easy goals to hit. They give the player something to aim for that’s within a short reach, perhaps to soften the blow of needing 120 steel to craft an entire bedroom set so that a bunny will visit your campsite. Aside from the obvious cash grab that hits you early on, Animal Crossing: Pocket Camp is still a strong title that suits the typical playstyle for the devices it’s available on. Players unlike me (so, patient people) will most likely see the lack of steel to simply be an excuse to keep running errands until they earn enough to keep on crafting, and will hopefully enjoy their time doing just that. Next Post So, How’s Everyone Playing Their Switch? Steel crayons are the best crayons. I’m glad you’re enjoying the game! I only played Animal Crossing on GC so far and liked it quite a lot. My phone is waaaay too old to run a new game like this, so I’m happily watching everyone else go about their camping lives without me. Thank you for the porpoises. They made my day! I hope Nintendo doesn’t bank on this being a mobile platform from here on. I did like Animal Crossing DS quite a bit and would love to see it on Switch one day. I just hope the cash grab system doesn’t prove to be so profitable for them that they just keep it on the mobile platforms. And steel for crayons?! i didn’t know that went into the wonderful sticks of colours. Don’t get me wrong, any cash in Nintendo’s pocket is good, but I do agree with you. Free games may be profitable but it’s purely banking on a tiny fraction of the player base to drop money. In other words, they bank on getting people hooked, which means everyone else gets a crappy experience with it. More money means more games, so that’s a good thing! I’d rather have just paid $10 up front, like I did for super Mario run. I have been having a hard time finding cotton. I’m wondering if everyone gets different items like random rewards. I have tons of steel and wood. What level are you? And I’m also very short on cotton. Wood seems to be the only thing I can manage to keep large quantities of, although a single large item (like a bed or something) requires like 60 wood at a time so it’s gone in an instant. 17. I have 12 people that can come to my camp and will only have an issue when it comes to cotton.